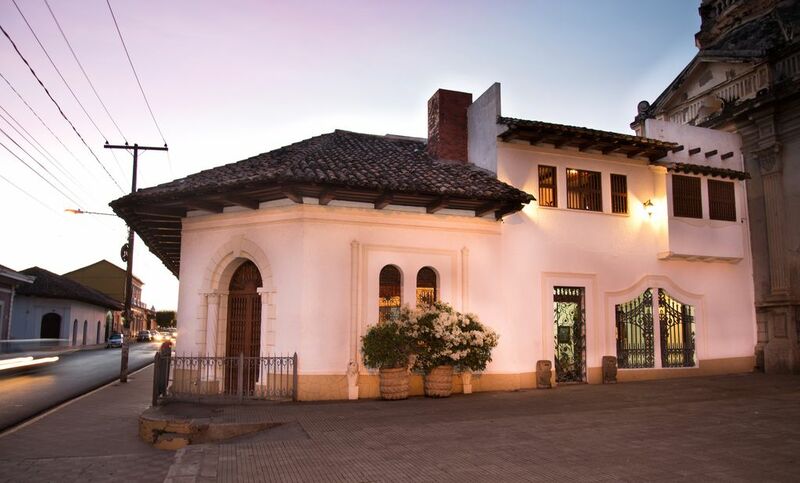 A 10,000 sq ft restored beautiful colonial house in the hearth of Granada. This house is fully equipped. Has 5 large colonial style bedrooms with bathrooms and air conditioning, 4 big corridors, 3 patios, 4 lounges, dining room, bar, pool, sculpture fountain, a waterfall volcano rocks wall, indoor garage for four vehicles and mezzanine with antique family pieces and french furniture. This is the most beautiful home in Granada. Built with Spanish Colonial Elements and fully equipped with antique french, English, American and Nicaraguan furniture all around the house, over 40 paintings, library and two grandfather antique clocks. This house has been in publications, books and paintings. San Miguel home is situated next to Iglesia La Merced (La Merced church), on Calle Real (Real Street). The house is just 2 blocks from Granada´s Central Park. The home features five bedrooms in the following arrangement - Three spacious bedrooms each with king size beds, bathrooms, air conditioning, furniture. A fourth bedroom is located on a second floor and is ideal for a live in nanny or maid, also equipped with two twin beds and bathroom downstairs. A fith room second floor with a view to Iglesia La Merced and Calle Real. Well vented with breeze from the East side. All rooms are fully equipped with beautiful antique furniture. The living areas are organized around extensive corridors fully furnished with antique furniture, library, dissected African buffalo head, antelope heads and elephant ivory tusks on the wall. There is a private familiar bar and seating area next to the pool. The opposite end of the pool is located next to a waterfall volcano rocks wall from Masaya volcano. The home has three classical colonial living rooms with doors directly to La Merced Church´s atrium and view to Calle Real where you get a cool breeze coming from the East (Nicaraguan Lake). Iglesia La Merced was founded and built on 1,783. It is Spanish style and beautiful baroque facade. This house was built on the 18th Century by Mercedariosy friars. Evaristo Carazo, ex Nicaraguan president lived in this house. Next to one of the oldest church, Iglesia La Merced, founded and built in 1534. Gets an excellent breeze coming from Iglesia La Merced´s atrium. Ride a catamaran boat and spend the day in one of the Isletas (small island) for US$250. toilet, combination tub/shower, bidet, Big bathroon. 2 individual sinks. Big mirror. Closets. we are not that kind of people that like to put negative reviews if sometimes an accomodation is not as expected, but we feel we have to warn other people. This house could be amazing, but everything inside is old, very old! everything smells bad and feels dirty. Mouses in the kitchen! very old and dirty tools in the kitchen. There was no water in the morning, some at night without any pressure and cold. There isn't any glass in the windows, impossible to sleep with the noise in the middle of the City. Unless the owner refurnish the place, this house should not be on VRBO or rented as a holiday home. But the City and the region of Granada is a beautifull destination! A bit of paradise in city center! Our party of 4 couples was very comfortable in this grand historic home. The listing is accurate, the property very well maintained, by 2 pleasant and attentive men. We parked 2 autos within the building. Enjoyed the lovely, clean little colonial city with excellent restaurants and shops; delighted in a boat excursion through the nearby 365 Granada Islets and an easy day's excursion to Managua. Strongly recommended to friends & family. We suggest visiting Nicaragua via airlines, since the very crowded and most inefficient border crossing from Costa Rica by auto consumed several unpleasant hours each way. A delightful base for exploring Granada, and an impressive piece of historical building in itself. Almost too delightful - it was occasionally more tempting to enjoy the inner courtyards than to wander out into the heat. Anyone with an eye for architecture and history will enjoy the place. This is not a hotel, and it's a bit more grand than a B&B. Our family group of 10 fit in easily, pleasant house staff cooked a good local dinner, kitchen was available to us for breakfast and snacking. Felt like being guests at a grand hacienda, with the owners mysteriously away just now. Price per quality ratio superb. A couple of block's walk to the central square and services, trivial for even moderately outdoorsy types. Elder visitors may want to account for the heat and bustle. Supermarket a bit further out, a ride is recommendable. Loved it, 10/10, would stay again. I felt like I had moved into a beautiful piece of history; surrounded by museum quality furniture and art. The courtyard wall shared with the church was amazing. I could float in the pool and see the bell tower. We were in a world apart from the city but in the center of the action when we walked out the door. The staff were attentive and thoughtful. The experience was exceptional. Very special rates for stays longer than 2 weeks.